To be frank, I don’t often use night creams because they are usually too heavy for my skin. I’ve tried night creams from brands like Clarins, Jamieson, Lancôme, Nuxe, and Yves Rocher, only to revert to using richer day creams at night. Night creams usually end up being no different from a day cream or too heavy for my skin (and thus I wake up with a greasy face, and worse, this is sometimes accompanied by badly clogged pores). 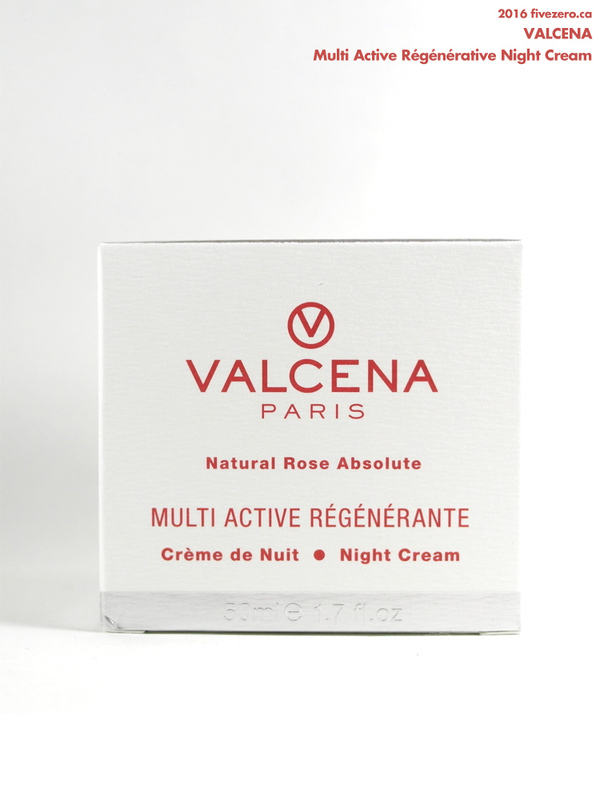 Not that I’m such a connoisseur of night creams, but Valcena’s is the first I’ve tried that feels more moisturizing and protective for me than a day cream, that also doesn’t end up being too rich for my dry skin. I was pretty thrilled that a $13 cream from Winners was doing such a good job, but of course, you can never count on Winners—the Canadian TJ Maxx—to carry a product you like! When I scoured my local Winners again for more Valcena, I could only find a day cream from a different product line, for C$12.99 as well, so I snapped that up! Eventually, I did a quick Google of Valcena but could not really find any retailers that I could use from Canada, so I did what any good blogger would do and I emailed them to inquire about their North American stockists, as well as their retail pricing since Winners isn’t too accurate with their “Compare To” MSRPs. The Multi Active Régénérative Night Cream‘s active ingredients are Damascena rose oil, vegetable oils (castor and olive), jojoba oil, and chamomile extract. 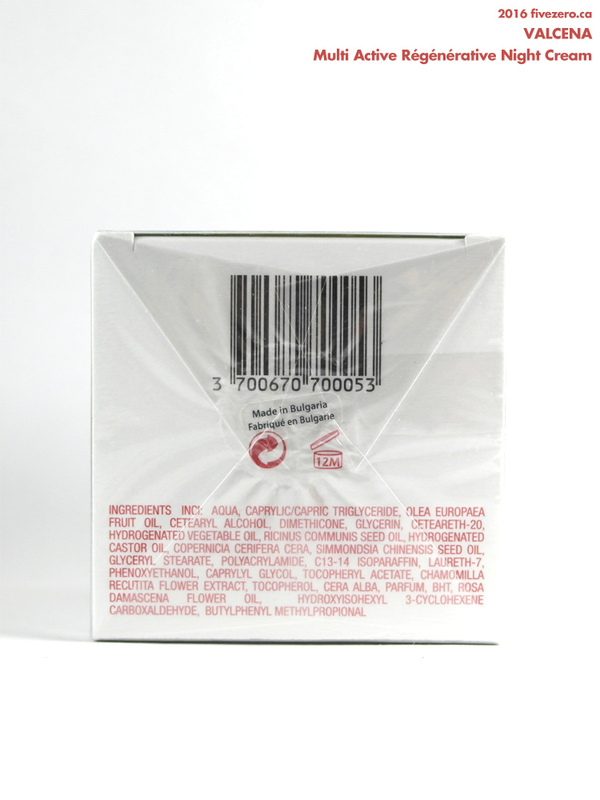 The cream is packaged in a dark red jar made of sturdy plastic. The cream itself is contained in an opaque white jar that is set inside a translucent dark red outer shell. I do prefer the feel of glass jars for higher-end skincare products, but honestly, plastic is safer since I do have a habit of dropping things on my bathroom floor. A small plastic scoop is also packaged with the cream, presumably so you don’t have to stick your fingers into the jar for hygienic reasons, but I am a finger-dipper, so I tossed that. (Actually, I’m more of a finger-patter: I just pat my clean fingertip onto the surface of the cream.) The screw-on cap is also a two-piecer made of plastic; this part of the packaging doesn’t feel as sturdy, and as nice as it looks, I think Valcena might want to redesign it to feel surer in the hand. The main selling point for me, the rose extract, smells quite lovely. This cream is well-scented, so the very sensitive-skinned should probably stay away, but I love scented creams so this is just perfect for me! 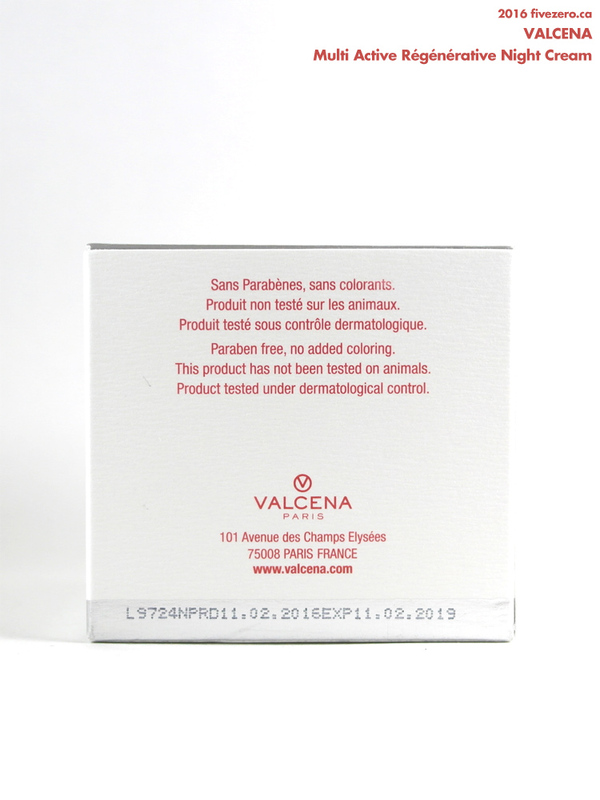 Valcena’s rose scent is a heavier rose, with a touch of lipstick about it, but it also has a watery aspect to it that reads as a dewy rose. The cream itself is opaque white and has a light texture. It smooths onto the skin well and absorbs nicely, without leaving a heavy or greasy feel. A little goes a long way, too, so I can see this 50 mL jar lasting me longer than the equivalent amount in some other creams I’ve tried (ahem, Clarins). I haven’t had any breakout issues while using this cream, and in the morning my skin feels well-moisturized. I can’t speak to any resulting glow or skin restoration (plus, I was seven months pregnant when I first started using this cream, so my skin was probably looking especially decent then, ha! ), but overall I quite like this cream and it does what I want for a night cream. The only other caveat I will make is that I have only tested this cream over the last four months, during which the weather has been warm and humid here in Toronto. My mid-30s skin gets much drier in the winter, so I might have to update my review after using this product during the colder seasons. I’m really glad I bought this product “blind” at Winners, and I suggest that if you come across it yourself, the CA$12.99 price is just about too good to pass up! If I see another one of these night creams, I’ll definitely have to pick up more for my stockpile. Luckily, the jar I bought doesn’t expire until 2019! It’s good for one year after being opened. 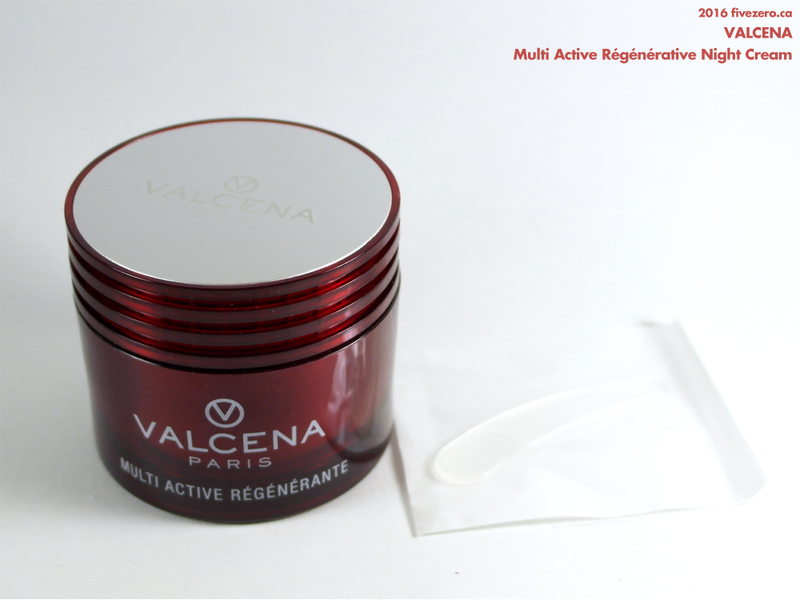 Valcena Multi Active Régénérative Night Cream comes in a 50 mL jar and can be found at one online store for about £30, though I do not know whether this is the official MSRP. The Valcena representative didn’t actually give me any pricing information. She did indicate that the company is planning on launching a Canadian online shop in September 2016, but for the time being, their products can be occasionally found at TK Maxx (in the UK), and obviously I found them at Winners in Canada. I love random skincare at Winners! I’ve been reading the labels more recently – there’s some gems to be found! And go figure, you find something you love and it’s difficult to to replace… grrr. But what amazing customer service on their part! If I see this at Winners for $13, I’ll pick it up for you! Thanks for the offer! 😀 Gotta get more eyes out there at different Winners locations, right? They really have so much stuff nowadays that I can barely get through it. Lots of Korean stuff now, too. Yes, I’ve noticed a lot of Korean stuff at Winners now, some recognizable brands like Holika Holika. Will do!! Yes, I saw a HH mascara that looked really interesting (but it was still a bit cheaper online after Cdn tax). Yay! If you get it, I hope you love it! And yeah, my blog’s a little old but I wasn’t too serious about it until recently. One of my bigger regrets! Haha, I’m a lazy gal, myself! I only use night cream so I’m not a shrivelly prune in the morning! Awesome post! I’ll keep my eyes peeled next time I’m browsing Winners. If a product is rose scented, I want it!